The Natural History Museum is a world renowned centre for research specialising in identification and classification of species and conservation. It holds 70 million biological and earth science specimens within 5 main collections: Botany (plant science), Entomology (insects), Mineralogy (minerals), Palaeontology (prehistoric life) and Zoology (animal biology). Many of the collections have historical value such as the specimens collected by Charles Darwin on his famous voyage around the world on the Beagle. The museum was based on the collection of Ulster doctor Sir Hans Sloane which included dried plants and animal and human skeletons and was bought by the British Government and initially housed in the British Museum in 1756. By 1860 the collection had expanded so much that it was accepted that a separate museum would be needed. This was at a time that the subject of natural history was a topic for intense national debate – three years earlier Charles Darwin had published the Origin of Species which proposed the theory of natural selection and evolution which set his supporters at loggerheads with those who supported the Biblical explanation of creation. Work commenced in 1873 and the new museum opened in 1871. This vast and impressive building has a cathedral like frontage of sandstone with horizontal stripes of blue brick set in terracotta decorated with many ornate arches. pillars and sculptures of animals, birds, insects and fish running the whole length of the 200 metre facade. Living species are represented to the left of the entrance and extinct ones to the right. This explicit separation is thought to relate to Darwin’s theory of natural selection but it is not clear whether this was a contemporary endorsement of the theory or a rebuttal. Below the enormous central arch a wide stairway leads up to the spacious Central Hall , a gallery decorated with carved fauna and with a richly painted ceiling and housing the famous diplodocus dinosaur skeleton cast affectionately known as ‘Dippy’ which takes up the full length of the hall. The Darwin Centre extension is a recent addition to the museum and is partly designed as a storage facility for the valuable collections, but also as work space and a location for educational experiences for visitors. Among best of the museum’s must see exhibits are: the Dinosaur Gallery with the roaring animatronic T-rex; the parallel skeleton and model of a blue whale, the skeleton is 25 metres long and weighs 10 tons; the Restless Surface Gallery in which the ground shakes as a part of a replication of conditions during the 1995 Kobe earthquake; the Creepy Crawlies room (insects, spiders crabs and their relatives); a cross section through a Giant Sequoia tree and the ‘Bee Tree’ in the lovely Wildlife Garden – the tree opens to reveal a bee hive. The museum is divided into four zones: the Blue Zone in the west wing (which is to the left of Dippy the dinosaur skeleton); the Green Zone in the east wing (which is to the right of Dippy);; The Red Zone at the furthest end of the east wing (the Red Zone can also be accessed from a level entrance on Exhibition Road) and the Orange Zone which is in the new Darwin Centre. The contents of the four zones are set out below. 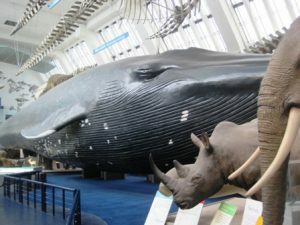 The Blue Zone: the Dinosaur Gallery; Mammals (including the blue whale), Images of Nature; Fishes Amphibians and Reptiles; Human Biology; Marine Invertebrates. The Green Zone: Central Hall; Fossil Marine Reptiles; Fossils From Britain; Ecology; Creepy Crawlies; Birds; Giant Sequoia; Our Place in Evolution; Minerals; The Vault; Primates; Tree. The Red Zone: Visions of Earth; Earth Today and Tomorrow; From the Beginning; Earth’s Treasury; The Power Within; Restless Surface; Earth Lab; Lasting Impressions. The Orange Zone: Wildlife Garden (including the Bee Tree); Darwin Centre. 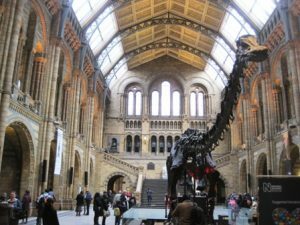 The Natural History Museum is open every day (except 24-26 December) and entry is free. Charges may apply to special exhibitions.